This review was made possible by Double Duty Divas and Pampers. I was provided product free of charge to facilitate my review, but all opinions are 100% mine. In Case you didn't know, Pampers Swaddlers is the #1 choice of hospitals in North America! It's also the first diaper worn by millions of babies. They keep our Babies comfy and protected through their entire journey of amazing firsts.(i.e. First steps, First crawl, etc.) Pampers understands that there is nothing more joyful or rewarding than the precious first-time moments shared by our little ones and our whole family! Color changing wetness indicators always let me know when Gabby needed to be changed. It was a huge help on days when we were so out of it that it felt just like a dry diaper. Pampers Swaddlers is considered Pampers' softest diaper. It offers up to 12 hours of overnight protection! A lifesaver when you really wish they'd sleep through the night. When Moms spoke, Pampers Listened! The Pampers Swaddlers softness that we know and love are now available throughout our baby's diapering years....All the way through size 6! Greatest part is the Absorb Away Liner® to pull wetness and mess away from babies’ skin. Are you Available for a #PampersFirsts Twitter Party taking place on Wednesday February, 11th at 9pm EST? If so, be sure to Join in on the Fun. 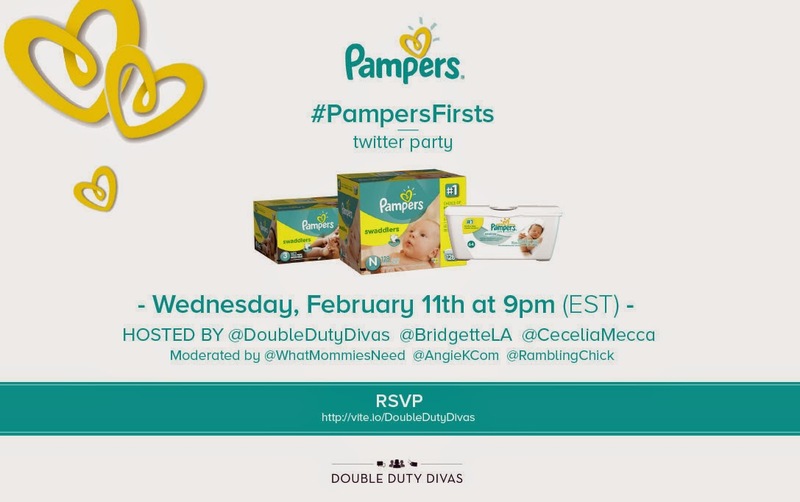 To participate RSVP HERE and follow these Hosts on Twitter: @DoubleDutyDiva, @BridgetteLA, @CeceliaMecca, @AngieKcom, @WhatMommiesNeed, @RamblingChick, and our Sponsor @Pampers. In honor of this special journey, Pampers has released a compilation video entitled “Firsts” that highlight those astounding “first” experiences together. From the first time we parents see our little one on a sonogram to the first evening we bring them home from the hospital, the Pampers “Firsts” video showcases precious, heart-felt moments babies and parents share together. 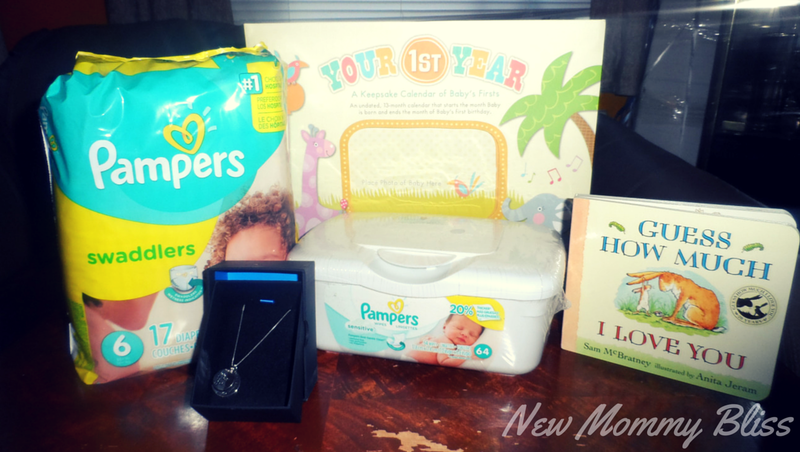 Pampers recognizes that all first moments, no matter how big or small, are moments to be cherished and celebrated. Pampers is honored to be a part of the journey of firsts for millions of families around the world every day. I love that first smile!! My most memorable first was the first bath..so fun and cute! I like the first smiles and laughs! Baby's first steps were memorable. The most memorable was when our son said his first word - mama! The first smile was the most memorable for me. I just loved my son's first smile and laughs! So precious to me! His precious little army crawl when he decided he had places to go was oh so memorable. My First Memorable Milestone is the first step. My granddaughter just started laughing. It's my favorite first right now. The first smiles were always my favorite. I'm really looking forward to my little ones first word. The first gut laugh is the best!!! I can't wait until the first steps with my daughter. I cherish the memory with my son and can't wait until she reaches it as well. The first time my grandson called me granny! So many memorable moments! My favorite was probably when he said, "I love you" for the first time! My favorite was the first time she smiled. I loved when my son took his first steps. We always use pampers too! The first time he laughed/giggled. The first smile and giggle. I love when my son took his first steps!!! I am looking forward to holding my baby for the first time. I cant wait! I am beyond looking forward to the walking stage! The most memorable was when my daughter took her first steps! I loved that first word. My most memorable first was the first was the first time she said momma. I loved my daughter's first laugh. 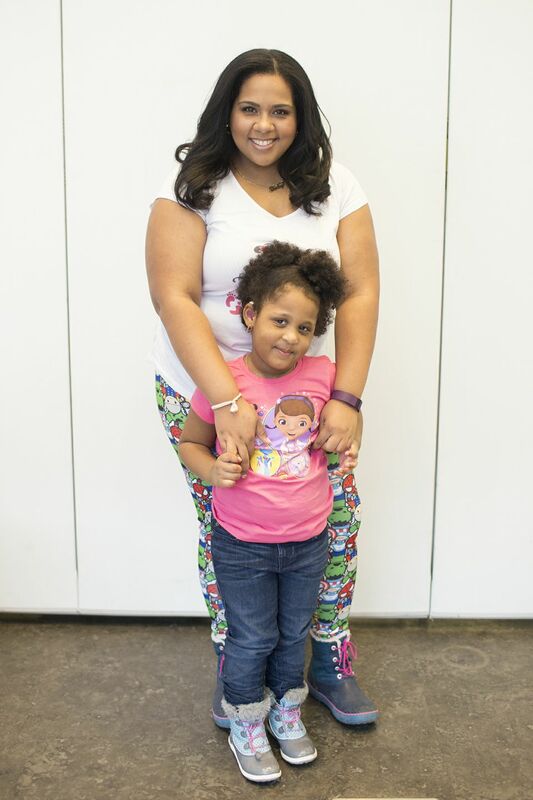 My favorite milestone is when my daughter first said "mommy"
My favorite milestone is when my daughter started walking. My favorite milestone was their first steps. I am looking forward to the first words! First smile was the cutest. I cant wait for my little girl to be able to go to the restroom on her own . I was excited to see my babies' first smiles. Mine was when my daughter took her first steps! Glad I got pictures of almost all her firsts! My baby just rolled over yesterday - one more milestone checked off. They grow so fast! My favorite first milestone is the first real smile and not the "gas" one but that is adorable too. I loved when she started walking. I cant wait til she starts talking. The first milestone that I remember was a visit to the pumpkin patch. Thanks for the giveaway! My first favorite memory was the baby's first smile. I thought hearing my daughter say daddy for the first time was amazing. First time my daughter looked at me and said Mommy was awesome. My favorite milestone is when babies start to walk. I'm looking forward to seeing our son's first smile! My youngest granddaughter is starting to walk and I have 2 more coming in the spring. Eight total, wow! I loved seeing my son take his first steps! My favorite memorable milestone is hearing my children tell me that they love me. I'm now looking forward to watching them both graduate from school. My daughter will be graduating from the 8th grade this summer and my son will graduate from high school next summer. They have both made me a very proud mother. I love them more than anything. They grow up way too fast. I'm sure you might be wondering why I am entering since my children are older. I have a nephew that we buy diapers for sometimes to help out. I'm pregnant with my first baby and due this summer, I'm looking forward to the first breathe, first smile, first laugh, first crawl, and first steps! I enjoyed the first steps from jake. It was a great moment that we witnessed. My most cherished memory has to be the first genuine smile! The first smile just melted my heart! I love it when they start to say their first words. The first smile is the best milestone, and it doesn't create more work for you like when baby starts crawling or walking! I will never forget her first giggles! Such a special memory! I'll always remember that first little smile. The first full-belly laugh. The one where they can't stop laughing. It's magic. My favorite first milestone that my son has reached was his first word which happened to be mama! The first laugh is one that I will always remember. Hearing each of my grandchildren say G'ma for the first time ever. My favorite are the first words. No milestones yet, I'm currently expecting my first, due May 1st! But I am overjoyed just thinking about all the little things my daughter will do! My first memorable milestone was watching my daughter learning to sit up all on her own. I look forward to learning to tie shoes. With each of my kids their first real smiles were my favorite. .
No kids, but I loved it when my niece took her first steps. I liked the first steps! I love the first real smile. The first smiles and the first coos are just so heart melting. I love them. My sweetie started smiling last week - its so precious! My favorite was my son's first smile. My favorite milestone was when my daughter started walking. I love those first hugs! My favorite was watching her take her first steps! I'm looking forward to first word. What was your First Memorable Milestone? I'm looking forward to his first steps! I love their first laugh. It seems as though each new milestone is my new favorite. Two weeks ago my sweetie girl got her first tooth, and boy, it that exciting! Now she's pulling herself up onto everything and everybody. So that's my NEW favorite. My son's first smile melted my heart. My favorite milestone is losing the first tooth. My favorite first is when she took her first steps. One of my favorites were first words!!! My favorite milestone is smiling. Well, since it's so recent...my 6 month old said "mama" on the day she turned 6 months old. The first word is adorable! I am waiting for her first tooth to pop up. It should be really soon. I love their first giggle and smile! They're all great! I am looking forward to that first step for walking! My favorite first milestone was my son's first steps. My favorite was when she laughed for the first time! My favorite milestone was the first time my son sat up..so cute watching him wobble and finally stay sitting by himself! My favorite was the first time my son laughed. He was asleep on me and just started giggling. I loved when my son started reading. I am most looking forward to my grandsons birth day, he is due to arrive june 1st. first steps are my favorite. 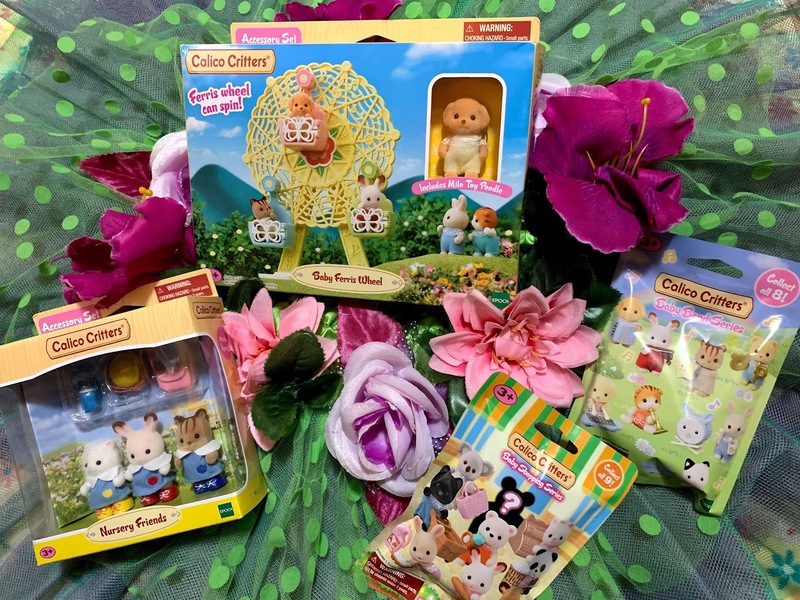 Thanks for the chance to win this . First steps are my favorite....although it was many moons ago I am looking forward to my nephews first steps now :) Thank you for the chance. I am looking forward to my friends baby's 1st steps. Im most looking forward to the first steps. I look forward to potty training and no more diapers. Watching those first steps is amazing! (A little sad at the same time knowing that it is going by too fast!! My son's first steps because we waited so long for him to walk. My favorite milestone is babies first smile. That first big smile. :) Precious. Walking was the most memorable. I am torn between my son laughing for the first time and when he took his first steps. Our daughter's first smile was our favorite milestone. I liked the first time my son ate a lemon! You should YouTube babies eating lemons for the first time! SO FUNNY! The first memorable milestone was definitely the laugh. Absolutely and it is her most endearing quality. How We Tackle the City and Party with No Leaks! Manito® Weather shield & Cozy Hand Muff Review!